To develop a strategy for communication and information between workers’ representatives on the European/ SE works council and the categories of workers represented. Another type of made-to-measure training consists of language workshops aimed particularly at certain European/ SE works councils. supply estimates on the basis of requests submitted by European works councils / SE works councils and their management. Training courses lasting between one and five days have already been arranged and conducted for works councils as diverse as those of Allianz SE, Air France KLM, Akzonobel, Albany, Axa, Borealis, Capio, Carrefour, Club Med, EDF, Exxonmobil, Fortis, Fresenius, Freudenberg, Forbo, GfK SE, Heinz, Kodak, Lafarge, Lhoist, LSG Skychefs, Manoir Industries, P&O, Pernod Ricard, Securitas, Suez, Sunalliance, Syngenta, Thales, Telia, Thames Water, Vinci, Vivendi. Peter Scherrer: (ETUC Deputy Secretary): Why training is essential for European Works Councils? Peter Scherrer, deputy secretary general of the ETUC, on the need for EWC trainings. The booklet was developed by the European Workers’ Participation Competence Centre (EWPCC). It is the first of a series of practical and helpfully illustrated manuals for workers’ representatives in transnational information and consultation bodies. 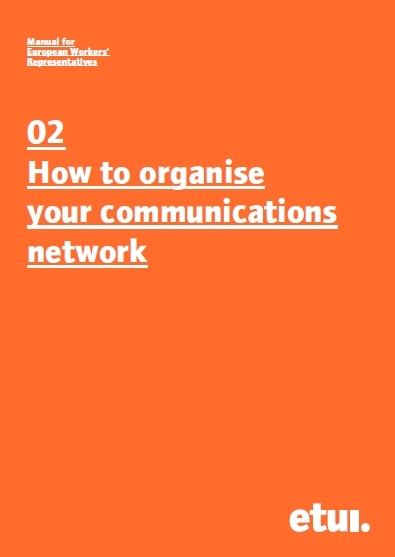 The first manual offers some practical tips on how to make meetings European bodies (also as EWC or SE works councils) more useful, more efficient and more successful. The manual is currently available in eight languages and can be downloaded as pdf (DE, EL, EN, ES, FR, NL, PL, SW).